The Compliance Simulation game Integrity Now!® is been applied by more than 20 companies!! The compliance simulation game "INTEGRITY NOW!" 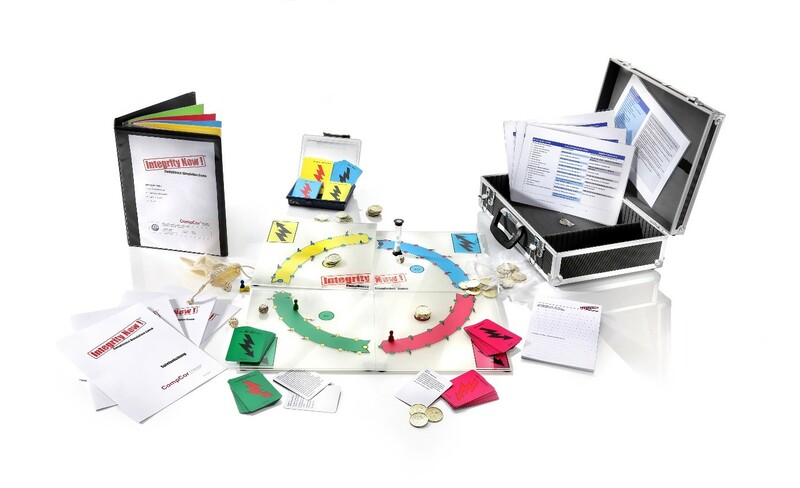 Our experts have incorporated their specialized knowledge into a board game that is intended to help you arrange the focus of face-to-face training on compliance better and more appealingly. Game meeting: If you would like to experience the game please visit one of our regular "game meetings". Understanding and problem-consciousness of incidents related to compliance are considerably strengthened by the communication between players and the moderator in finding solutions for the different situations. The playful approach to complex situations relevant for actual practice means more enjoyment for participants during compliance training sessions. Valuable practical information for moderators in a comprehensive "Moderator Support Booklet", developed by experts with many years of practical experience. To acquire experience from case studies closely related to actual situations, for your own practical use. To correctly assess situations relevant to compliance. To develop a feeling for which intervention is necessary or not at what time, based on the aftermath. To receive feedback from colleagues/other players for own decisions, and apply it to one's own situations. To develop a flexible set of action-strategy tools for own use.